Judy is currently in private practice in Alamo, CA. She obtained her physical therapy education at Columbia University and a Masters in PT at New York University. She specializes in cerebral palsy (CP) and works with children with CP and other movement disorder problems. Her interests are in helping children achieve motor learning, motor control, muscle strength and ROM by using electrical stimulation (ES) together with movement science and motor learning ideas. 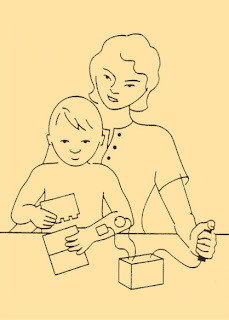 She developed a task specific method of using electrical stimulation that is discussed here and illustrated with pictures and videos. Consultations are available for your child in person or by sending a video tape. For instructions on the video tape or having a workshop at your facility please inquire at info@judycarmick.com. Dynamic-task-specific approach to neuromuscular electrical stimulation (TASES) is evidence based, for children or adults with cerebral palsy. Electrical stimulation (ES) can activate muscles and provide sensory and motor input and awareness to the user. This increased muscle awareness and ability of the muscle to contract assists muscle and movement function. The child’s joint range of motion increases, the muscles become more active and benefit movement and function immediately as well as over time. The difficult part of using ES is deciding which muscles are needed. 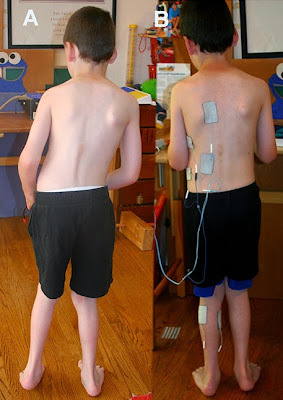 Photographs and videos are presented here as evidence of how electrical stimulation given the needed muscles can improve alignment, muscle function and skill development as well as decrease spasticity. ES has many names, neuromuscular electrical stimulation (NMES), functional electrical stimulation (FES), and task specific electrical stimulation (TASES). All these methods want to improve muscle function, range of motion and muscle strength. ES is beneficial to improve muscle function in other conditions, besides cerebral palsy, if exercise is indicated and there is an intact nerve. Task specific electrical stimulation (TASES) is used to provide sensory and motor input at the time the muscles are typically contracting while the patient is engaged in and initiating movement with a motivating goal or activity. A remote switch is used during dynamic activity to assure the needed or typical timing of the stimulation. The therapist needs to consider the biomechanics and kinesiology of the activity and muscles involved when deciding which muscle to stimulate in what position and at what time. The settings for TASES are different than traditionally used and are discussed in a published letter (#1 in publications list) as well as many of her publications on using this method. The goal is that the user learns from sensory and motor (muscle contraction) input during the stimulation. The simulation is felt by the child to learn that the muscle is there and can be used. It is desired that a muscle contraction occur but it is always within the user’s tolerance and a high contrition rate is not a goal. It is above a sensory motor level and not below as muscle hypertrophy could not occur. The amplitude is raised as the tolerance is increased and needed for the task. It does not need to be at a high level to increase muscle function or the child’s voluntary contraction. Traditional use of ES often recommends 68% maximum voluntary contrition (MVC). That is usually uncomfortable for adults and is too high to be tolerated for long. Typically muscles do not traditionally operate at a level which would cause fatigue to occur quickly and then prevent the child adequate time to practice the skill that TASES is helping the child or adult learn. Muscles operate at different contractual levels as shown by the differences in running and walking. If one is walking the calf muscles are not operating at such a high level. If the muscle contraction was at a high contrition level the child may toe-walk when the goal is for heel strike or a flat footed gait. Of course one can toe-walk without a strong calf muscle contraction. Bringing the knees forward over the toes will cause the heels to come up off the ground and result in toe-walking. Photographs and GMFM scores are shown below as evidence of the effect of TASES on a child. Photo A (below) on the right shows the child’s standing posture without ES. Before ES was used he stood with the upper body leading to the right and the hips to the left with more weight on the toes than the heels and the knees closer together than the feet. The hips knees and ankles are not aligned and the right shoulder is lower than the left. Photo B shows him standing at the end of his PT session as ES continues to stimulate the trunk. During PT TASES was used to the calf and hip muscles and are no longer being stimulated. There is carry over from that ES input. The child’s hips and upper trunk are better aligned, the feet are closer tougher, the knees more over the ankles and the weight shifted back more on the whole foot not just the left toes. The trunk continues to receive electrical stimulation and is assisting with trunk alignment. The shoulders are now level and the spine straighter. Many people are afraid of using ES to the calf muscles for fear it will increase spasticity and that the child will be more up on the toes. However, the calf muscles are the major postural muscles of the body and provide approximately 50% of the power for gait. They are the only muscle that operates much of the time at a strong functional level. They are extremely important and if one is weakened even in adults who developed typically, major problems in balance and gait will occur. They will lose standing and walking stability and gait efficiency. Step length on the uninvolved side will be shorter as the involved side being weakened will not be able to provide the needed body support for the uninvolved leg to take a long step. Surprisingly to many, ES to the medial calf muscle results in knee flexion and ankle bending (dorsiflexion). 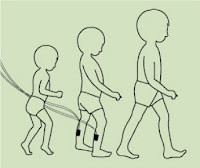 Carmick J. Forefoot mobility in ankle and foot orthoses: effect of gait on children with cerebral palsy. Pediatr Phys Ther. 2013. Children generally stay in their expected GMFCS level no matter what intervention is used. 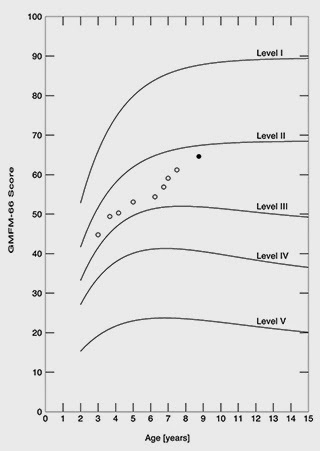 Superimposed on this chart are the GMFCS-66 scores (dots) of a child at Level III when he began TASES. When he reached the age of 7 he progressed more than he had and was expected according to the chart. By almost age 9 he progressed significantly as he changed from GMFCS level III to Level II. Outcome evidence for trunk, lower and upper extremities is shown on their example pages and in the list of publications with photographs and videos.